- To meet demands of the clients in an effective manner, we bring forth an impeccable range of Leather Jute Rugs. SECONDMAY provides high quality 100% Genuine leather Hand weaved Leather Rugs: all kinds of rooms & Floorings. Bring natural texture and softness to your floor with our affordable selection of leather area rugs. Whether you'd like to add a modern touch with a leather rug or add the casual elegance of a transitional leather rug, we have the options for you. Counted as one of the renowned manufacturers and suppliers, we are involved in offering a designer collection of Leather Carpets. These are available in various attractive designs, patterns, finish and styles following the exact demands of clients. We are renowned organizations of market for presenting the optimum quality range of Grey Leather Rug. We are one of the leading names in the industry for offering a wide array of Leather Carpet to our clients at reasonable rates. Owing to their attractive design, these Leather Carpet are highly in demanded. Manufactured from quality leather strips, our leather rugs, reversible leather rugs provides sturdy backing for thick feel underfoot. These leather rugs are resistant to wear and tear and other damages. On being easy in wash and maintenance, these deliver a long lasting service. We are one of the trusted companies of Leather Carpet. Our products are enormously admired in the market owing to their top features. Panel Size: 5x5cm, 10x10cm, 20x20cm, 30x30cm. 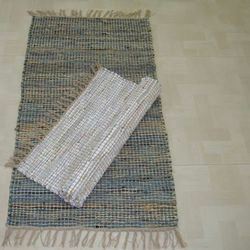 Products : Handloom Cotton Durries & Rugs, Leather Rugs, Jute & Wool Durries, Chenille & Viscose Rugs. Techniques : Pit Loom, Frame Loom, Jacquard & Punja. We are one of the leading manufacturers and exporters of leather shaggy rugs in the market. 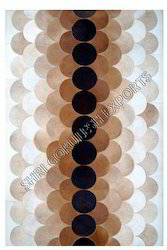 We bring forth designer leather shaggy rugs that are known for intricate designs. The attractive color combinations give them a unique appeal and make them ideal for the traditional as well as modern décor. Adding a new look to the home decor, we have for our clients Designer leather rugs. These patterns on these rugs are intricate and reflect our artisans mastery in designing different types of rugs. With a soft luxurious feel and bright bold colours, each handcrafted rug is a unique item. Leather Shaggy Rugs - Sizes 50x80 CM, 60x90 Cm , 120x180 CM , 140 x200 CM . we make all sizes and colours as per buyer requirement. Domotex International is leading supplier, manufacturer and exporter of good quality Camel Colored Leather Rugs. We are looking inquiries from Germany, Italy, Australia, Denmark, Netherland, France, japan, South Africa, USA, UK, Canada, Europe, Singapore, Thailand, Bangkok, Malesiya and Russia.